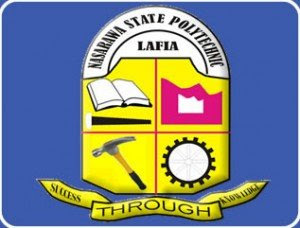 This is to inform Returning Students and newly admitted Students that the strike embarked upon by the Teaching and Non- Teaching Staff of Nasarawa State Polytechnic, Lafia has been called off. Students are therefore advised to resume immediately as lectures and all academic activities will commence as from Tuesday 23rd April, 2019. Both Returning and New Students have two weeks only to complete registration. The Public is also reminded that the Second List of successful Candidates for Higher National Diploma (HND) Computer Science, Nation Diploma(ND) in all Programmes, Pre-National Diploma (Pre- ND) and IJMB has been released. RECOMMENDED: NASPOLY Admission List for 2018/2019 Academic Session. Newly admitted Students are to collect their admission letters and commence registration immediately.